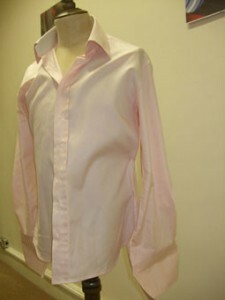 A special request for a pink shirt with a white trim. 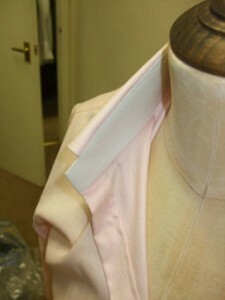 This is an unusual and skilled piece of tailoring and involves cutting and stitching the collar twice. The shirt was for Phil O’Farrell who, with Freddie Smith, represents part of the band Celtic Fiddle. (We made Freddie an extraordinary fish tail waistcoat which you can see under our waistcoats section). They play great Irish inspired tunes and you can listen to some of them on their MySpace account here. See also: celtic fiddle, extraordinary fish, fish tail, Freddie, Freddie Smith, Henry Herbert Tailors, Phil O'Farrell, request, savile row tailor, shirt, Shirts, Suits, Tailored Suits, wedding suits. A Special Shirt & Trim - Bespoke Suits By Savile Row Tailors.